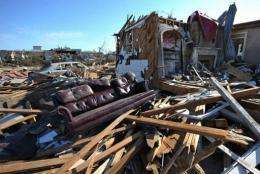 A sofa is seen next to a collapsed house in a tornado stricken neighbourhood in April 2011 in Tuscaloosa, Alabama. The United States is experiencing the deadliest year for tornadoes in nearly six decades, but a top US weather expert said there is no link between the violent twisters and climate change. The United States is experiencing the deadliest year for tornadoes in nearly six decades, but a top US weather expert said Monday there is no link between the violent twisters and climate change. Instead, the reasons for the spiking death tolls are more likely due to the rise in the number of mobile homes and the chance paths taken by a series of tornadoes that have happened to target populated areas. "This year is an extraordinary outlier," said Harold Brooks, research meteorologist at the National Oceanic and Atmospheric Administration's (NOAA) National Severe Storms Laboratory in Norman, Oklahoma. "This is the deadliest year for tornadoes in the US since 1953," he said, referring to June of that year when a tornado killed 90 people in Worcester, Massachusetts. A massive tornado tore though the Missouri town of Joplin over the weekend, killing at least 89 people, less than a month a spate of the storms struck across seven states and killed 354 people. Brooks said the contemporary US tornado record, which dates back to 1950, "can be a difficult thing to work with." But when scientists examine the most complete records available and adjust for changes in how tornadoes were reported over time, "we see no correlation between global or US national temperature and tornado occurrence," Brooks said. Nor are the storms themselves getting larger than they used to be, even though it may seem so after learning of massive twisters like the one in Missouri that tore apart a six-mile (10 kilometer) long, half-mile deep stretch of land. "Tornado deaths require two things. You have to have the tornado and you have to have people in the right or the wrong place," Brooks said. "The biggest single demographic change that probably affects things is that the fraction of mobile homes in the United States has increased over the years," he said. 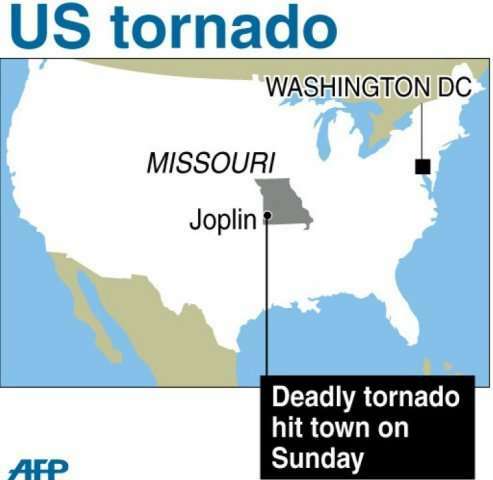 Map of US locating Joplin in the state of Missouri, where a tornado killed at least 24 people on Sunday. Anything that can be tossed into the air, like cars and mobile homes, can prove deadly in a tornado and people are urged to take shelter underground if possible. Twisters are formed when atmospheric conditions come together in a certain way. At low levels, the atmosphere is warm and moist, coupled with cold dry air above. Winds must be increasing in speed from the Earth's surface up to elevations of about 20,000 feet, with directional changes, known as wind shear, so that the southerly wind blows near the surface and gains speed at higher altitude. "In April, essentially we were stuck in a pattern where that was the way things were for a couple of weeks, and that pattern didn't move so we had repeated episodes that were favorable for producing significant tornadoes," Brooks explained. The weather phenomenon known as La Nina, which produces cooler than normal temperatures in the equatorial Pacific Ocean, may have had a "relatively small impact" on producing that pattern, but that is not the full picture, he said. "It's an area of research to try to identify why the pattern was so favorable and why it was favorable for so long." The tornado record does not show a steadily increasing trend toward bigger deadlier storms, he said. For instance, "2009 was a really low year for tornadoes. Some recent years have been big, some recent years have been small," he said. Since modern records on tornadoes began, the deadliest outbreak was on April 3, 1974. The "Super Outbreak" claimed 310 lives when 148 tornadoes over a 24-hour period swept across 13 states. The single deadliest tornado in US history, described in early accounts, killed 695 people when a massive twister tore up parts of Missouri, southern Illinois and southwestern Indiana in 1925. Probably wrong, there is evidence that methane hydrates are outgassing in the north, which indicates that global warming is increasing it's effects on the Weather. Add this to the record floods, and you will get a view of what's to come. Ten to twenty years of this, then a severe drop in tempuratures world wide. The polar ice caps are melting and polticians are already thinking of ways to exlpoit resources there, this is unheard of. Of Course you can find an expert to deny it, for each and every expert there is an equal and opposite anti expert....Soon this will hard to be deny. @MikeyK no it really doesn't, but what evidence would convince people who don't believe in global warming (global weirding) that it is happening? It's probably also worth pointing out that overall population in the South is increasing because there's been a trend of people moving from North to South in the past couple decades. That places a lot more people in tornado alley. The Birmingham/Huntsville area that got hit in the last bout of storms has expanded so much in the past 10 years that I hardly recognize the area each time I return to visit my brother there. The next time we get a hurricaine landfall we'll see the same effect as more and more people place themselves in vulnerable situations. From what I read, it's the same way in many places around the world. As far as global warming influencing the weather, well duh? What the guy above is saying is that there's no statistically significant trend. That doesn't mean that there's no influence, it's just chaotic. And thanks to the current economic crisis in the USA, far more people are living in trailers than in stick or brick built homes compared to even 5 years ago. But then, it's hard for any home to survive a direct hit or even a close call with a tornado. But you have less of a chance in a mobile home. Better warning systems and a populace who have access to shelters would certainly help. It's just a fact that a mobile home will not protect people nearly as well as a permanently built home. Due to primary home loan defaults these people will remain out of the market for permanent homes for at least the next 5 years, and if the economy and job market doesn't start recovering in some sustainable way - even longer. and if the economy and job market doesn't start recovering in some sustainable way - even longer. There is a way to fix this, but the socialists won't do it as they will loose power. It is a step in the correct direction when physorg posts an article that does NOT blame something on AGW. but what evidence would convince people who don't believe in global warming (global weirding) that it is happening? If AGW proponents would change their rhetoric from "believe in", as if it's some sort of religion, to "scientific proof" would be a good start for me. AGW theory should never be discussed in terms of "belief", it should be discussed as either there is or is not satisfactory evidence to justify engineering national policy towards addressing it. It's interesting though, because more regular extreme weather events would be something I would expect to see in a significantly rising average global temperature, by virtue of the simple physical property of interactions occuring in a warmer system will be more energetic/occur faster than those occuring in a cooler system, no? Interesting that they've found no statistical link. When I attended Auburn I frequently visited Atlanta. On one trip my roommate and I were in seperate cars, driving back to Auburn on a dark stormy night. He was no more than 5-10 minutes behind me on the freeway. I passed through the storm without incident. He had to stop because of all the debris on the freeway. I never saw it, but must have driven right past a cat 4 tornado. On the news the next day they showed the remarkable part of the story. The tornado had touched down right at the end of a trailer park. It followed the path of the trailer park for about a mile along the north side of the freeway. Then it jumped over to the south side of the freeway right at the end of the north trailer park. On the south side there was another trailer park that went on for another mile or so. The tornado followed that one too, and it ended after precicely destroying those two trailer parks. Nobody died though. Very odd. interactions occuring in a warmer system will be more energetic/occur faster than those occuring in a cooler system, no? Seasonal weather is so strongly dominated by ocean oscillations that it's not easy to see any change on a scale of 50 years. That's just not a long enough time to pick out such a small change as the one predicted by the IPCC (in storm strength that is) . They (the IPCC et al) have always said not to expect to see very much in terms of statistically significant change in seasonal weather events for a long time. I could go find a link to it in AR4 but I'm feeling lazy today. Not all effects are created equally, so while some things are easy to see, if global warming affects tornados we're going to need a bit more time to prove it through observation. I think we need to investigate whether there's a statistically significant relationship between land use and tornados. For instance, do trailer parks really attract them? I lived in kansas city for over 10 years. You can clearly see how the major land features influence the storms there. Some parts of the area always get hit. The river and lakes have a strong effect. I would be surprised if urban developement and farming don't also. Many of the storms I saw seemed to follow interstate 35 also. You would think that initially, but it isn't necessarily the case. Global warming would increase average absolute humidity (not necessarily relative humidity,) at all altitudes, which would hinder tornado development. Global warming would increase vertical shear, which would hinder tropical cyclone development, decreasing the average number of them. However, when cyclones do manage to develop, the maximum potential intensity would be higher on average, though not everything reaches it's maximum potential intensity, further, if the upper atmosphere warms it would cancel this effect. I think we need to investigate whether there's a statistically significant relationship between land use and tornados. Which I don't think lakes and rivers, and the valleys they run through, are any surprise to be associated with tornadic activity. The geographic elevation gradients could hep facilitate the temperature, pressure and multi-level wind velocity gradients that characterize certain aspects of tornado formation like downdrafts and subsequent vorticity? Finally, global warming would increase the earth's albedo, because you would have higher percentage of cloud cover, and clouds are about 4 times more reflective than water or land; except deserts, which have about the same average albedo as clouds. Once you have more cloud cover, you would be slightly warmer than we are today, but would hit an equilibrium point where the increased albedo due to increased cloud cover would cancel the increased greenhouse effects due to CO2 or any other greenhouse effects. Effectively, the Inter-tropical Convergeance Zone would expand northward and southward proportional to temperature increase, which would cool a larger and larger area of the planet via increased albedo. It would become an almost un-broken banding feature, perhaps 10 to 20 degrees wider in lattitude than it is now. It would become an almost un-broken banding feature, perhaps 10 to 20 degrees wider in lattitude than it is now. That's an extremely extreme statement, 10-20 degrees is massive, citation or math, please? Otherwise save such speculation for your blog. Also, as the ITCZ expands, I'm thinking so too would the equitorial tropical zone and definitely temperate zones. Don't forget to tell the whole story if you want to have any sort of credibility. Otherwise save such speculation for your blog. Yeah, the 10-20 degrees thing isn't the only part of his comments that is speculation. no source I can fine agrees. citation plz. snow cover? Wiki has a nice chart if you want to correct that. Land excluding snow cover has an albedo ranging from about 7-43%. Water around 8%. Desert around 28% (no different than other land types). Snow, which is on land, is 41-83%. Clouds range from about 38-78% (about the same as snow, and from 4 to 10 times higher than water). Geez dude, at least bother to do a google search before vomiting junk into the thread. There's a couple other things wrong as well, but I'm out of space. It takes cold air to spawn a large tornado. La Nina has caused very cold air to flow from the Pacific Northwest and over the plains. According to NOAA, Washington State's April 2011 average temp was 4.9 degrees colder than normal. And the temps haven't risen much through May (the high was 11 degrees colder than norm yesterday in Seattle). We've had a very cool, wet spring. And of course the jet stream's position and speed is creating more turbulence than usual. Expect more tornadoes than average until the wind from the north warms up. the US midwest is a convergeance zone. The cold air flows down from the Washington area and warm gulf air flows up from the Texas area. They meet over kansas (hence tornado alley) and missouri then it follows the prevailing winds to the east till it hits the apalaccian mountains. La Nina tends to strengthen it, but it's not 100% correlation. Weather is still chaotic. The idea that global warming would change the number or strength of tornados (up or down) in that area is a bit hard to prove I would guess. If anything, I would think that since they claim that the north is warming faster, then you'll have less of a contrast between those converging air masses, so less strong storms. Just a guess though. I didn't look up any reference.